Spain’s central capital, is a city of elegant boulevards and expansive, manicured parks such as the Buen Retiro. It’s renowned for its rich repositories of European art, including the Prado Museum’s works by Goya, Velázquez and other Spanish masters. The heart of old Hapsburg Madrid is the portico-lined Plaza Mayor, and nearby is the baroque Royal Palace and Armory, displaying historic weaponry. is a UNESCO world heritage centre and in northwestern Spain, is the capital of Salamanca province, part of the Castile and León region. With a history dating back to the Celtic era, it’s known for its ornate sandstone architecture and for the University de Salamanca. Founded in the 1100s and a key intellectual center in the 15th-16th centuries, the university continues to add to the city’s vibrancy with its international student population. is the capital of southern Spain’s Andalusia region. It’s famous for flamenco dancing, particularly in its Triana neighborhood. Major landmakrs include the ornate Alcázar castle complex, built during the Moorish Almohad dynasty, and the 18th-century Plaza de Toros de la Maestranza bullring. The Gothic Seville Cathedral is the site of Christopher Columbus’s tomb and a minaret turned bell tower, the Giraldo. You will be living with a local Spanish host family while in Salamanca to improve your speaking skills. Delicious local Spanish food while enjoying many choices of local foods you can purchase for lunch with friends and improve your speaking skills with teenagers your own age. In the afternoon we will all meet in the Plaza Mayor. Take a walking tour of Salamanca. 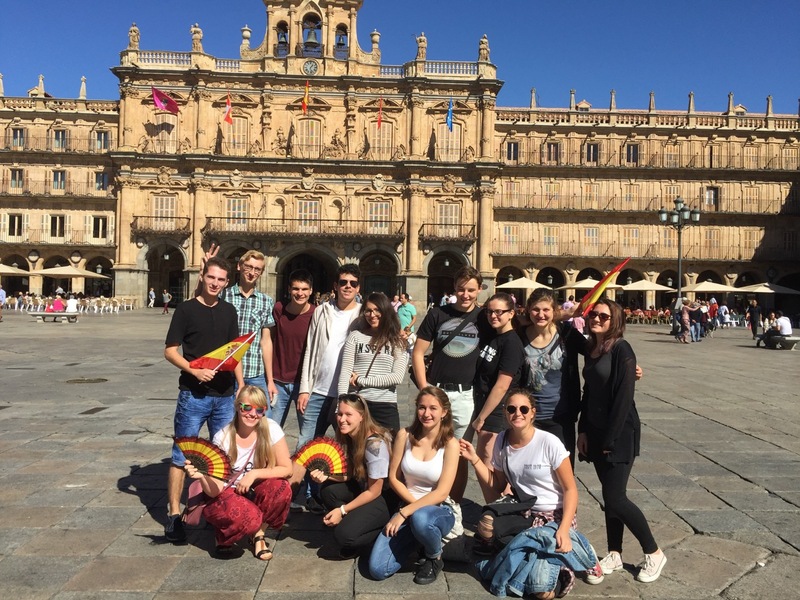 Weekend with your host family to enjoy the local immersion of family life and sights and live life as a local teenager in Salamanca. Meet at Language school at 9am for daily debriefing for a great week of Spanish language school and lessons start at 9:30am ‐ 1:30pm Lunch together as a group 1:30 ‐ 3pm Cultural excursions 3 ‐ 5pm and return home to your host family. This morning we make our way to Madrid. Meet at bus station at 9:00 and stay over night in Madrid overnight 3 start Hotel 1pm ‐ 2:30pm lunch. 2:30 ‐ 4:30pm Walking tour of Madrid. This will include Plaza Mayor, Puerta del Sol centre of Spain, Plaza Santa Ana, Literary Quarter, Parque Retiro At 4:30pm ‐ 6:30pm we a couple of Museum options: Museo del Prado or Galería Reina Sofía. Or we have the option to do 2 museums rather than Parque Retiro if enough interest. Today we depart depart Madrid by train to Seville. On arrival we will meet our host families. Then we meet at 4pm at local Spain coordinators discuss issues that have arisen in the first few hours and then start our walking tour of Seville . Full day excursion Jerez de la Frontera & Cadiz . will I gain from joining the Spanish Cultural Exchange study tour ? You will improve your speaking skills when you speak with local students your own age while attending a traditional Spanish language school. You will learn more about the culture and eat the most delicious traditional foods you will ever taste. 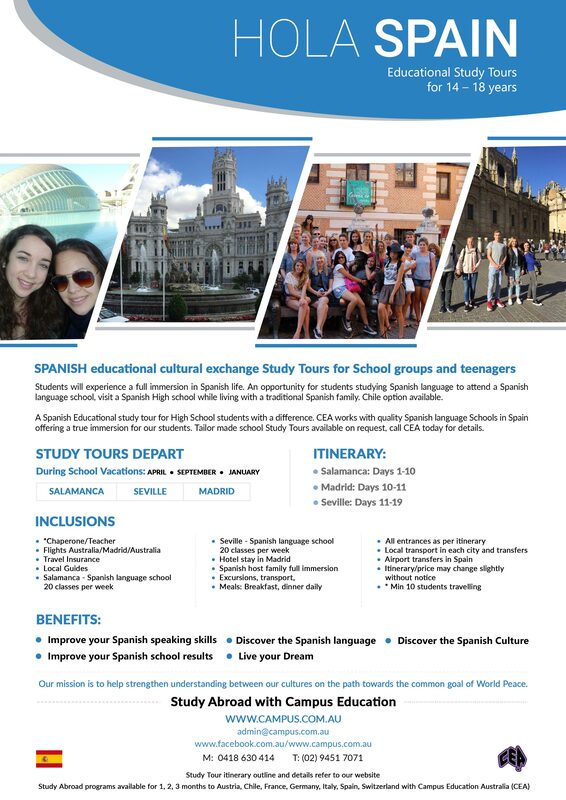 You will return back to school with a new insight, passion and excitement of the Spanish language and this will help you excel in your class and your exams because you have lived the dream, spoken the Spanish language and experienced the culture and food. This passion will go from your head to your heart. To improve my Spain speaking skills. Experience living with a great local Spain host family. Attend a local Spain high school.